In the past decade vacuum technology has come a long way. Today’s vacuums are not the dust-scattering, simplistic machines of your mother’s day. Now, they come equipped with complex settings and armed with attachments. These days, some models are even employing futuristic self-driven robotic units. Chances are you probably don’t need a vacuum cleaner that drives itself or parks out-of-sight on its own when it’s finished tidying up the kitchen, but if you’re after a product that’s going to rid your hardwood floors of pet fur and dirt tracks without scratching up the surface, you’ll want to take a little extra care in picking your next vacuum. Most hardwood floor vacuums work exactly the same as standard vacuums – an electric current operates a motor which propels a fan, ultimately creating a suction that allows the unit to collect dust, hair and other debris. While the cleaning method for laminate flooring, real wood flooring and vinyl flooring may differ, all three can generally use the same hardwood vacuum. That way, if you’re still settling the debate on vinyl plank vs laminate flooring, the good news is that the same vacuum unit should work for both. In an effort to prevent scratching, many hardwood floor vacuums include soft-bristled brushes that are gentle on surfaces but are great at picking up dust and other small particles. The only downfall of units containing these small brushes is they can sometimes get jammed or tangled when picking up human or animal hair. Overall, most hardwood vacuums include impressive suctioning units that pick up pet hair and other debris with ease. When it comes to mold and floor that’s stained by residue, a traditional dry vacuum cleaner may be of little help. Standard hardwood vacuums are great at picking up loose, dry particles, but fall short when it comes to deep-cleaning or scrubbing out dried-on substances or mold. Thankfully, if you’re in need of a vacuum that can fight mold and other hard stains, you have the option to purchase a wet vacuum. By implementing moisture (and often an additional cleaning fluid), wet vacuums are able to steam and scrub away tougher-to-beat stains on hardwood floors. Vacuum cleaners are not one-size-fits-all. When it comes to selecting a specific vacuum cleaner model for your hardwood floors, you have three major options: upright, handheld or canister. Each model type has its own pros and cons and which one works best for you will depend entirely on your needs and your home’s layout. Rather than split the vacuum head and motor into separate structures like canister versions, upright units are an all-in-one approach to vacuum design. Though they’re fashioned with mobility in mind, upright vacuums are often hazardous for hardwood floors. The rotating bristle which is standardly included on these models work wonders to pick up pet hair and dirt in carpeted surfaces, but are frequent culprits in cases of damaged and scratched hardwood floors. If you’re seeking a vacuum specifically for your hardwood or soft tile flooring, you don’t have to rule out upright units – you only have to be sure that the rotating bristles can be disabled. Additionally, be wary of products that claim to automatically shut off bristle rotation when the vacuum senses a change in surface. While this technology is good in theory, it only takes one hiccup to destroy a section of your gorgeous flooring. Another downfall of many upright vacuum designs is their faulty center of gravity. Depending on their design and weight distribution, some products struggle to stand steadily on their own, causing them to topple and crash to the floor. While this may not initially seem like much of a problem, it’s annoying at the very least and hazardous at the worst, especially if you have small toddlers or other children that could get caught as it falls. Unlike the upright vacuum, handheld units are shorter, simpler models normally consisting of a vacuum and suctioning device with no bulky body, additional cords or extension wands. They’re generally lightweight, cordless and highly portable. This simplified, no-frills version of the traditional vacuum makes handheld vacuums an ideal match for those living in tight spaces or small apartments where larger upright units take up precious storage space. Those with larger homes, however, will probably want to pass on the handheld unit. Because their abbreviated design doesn’t allow for an extension wand, you’re forced to bend over or kneel when vacuuming the floor – which is only a minor inconvenience in a small apartment but can quickly become back-breaking in a large home. Handheld units are also generally cordless, meaning they require a charge. While their battery capacity is generally enough to tidy a small room or vacuum the interior of a car, vacuuming an entire home would take an exasperating amount of charge breaks and pauses. In some cases, it’s possible to have the best of both worlds – a select amount of upright units are capable of converting into smaller, handheld vacuums. Unlike their upright competitors, canister vacuums have two-part designs consisting of a simplistic cleaning head and a longer suction hose that attaches back to the canister. Because houses the engine and collection bag separately from the vacuum head, there’s no limitation to the size of the engine or bag. For this reason, canister vacuums often tend to be some of the most powerful on the market. Bigger engine size can also mean better suction and a higher flow-rate – two elements that are absolutely essential when it comes to effectively cleaning hard floors, whether they be wood floors, interlocking tiles or any of the best types of plastic flooring. Canister vacuums may also be less likely to damage delicate hardwood. Unlike upright vacuums, canister vacuums split the weight distribution. When cleaning, you’re able to move the heaviest part of the unit minimally, which lessens the danger for scratches. With hardwood floor vacuums, height is essential. Because most carpet vacuums or dual-use products are designed with thicker carpets and soft flooring in mind, the surface of the vacuum is generally designed to sit higher. When these vacuums are used on hardwood floors, they’re too high and thus too far from the surface to be able to collect debris. 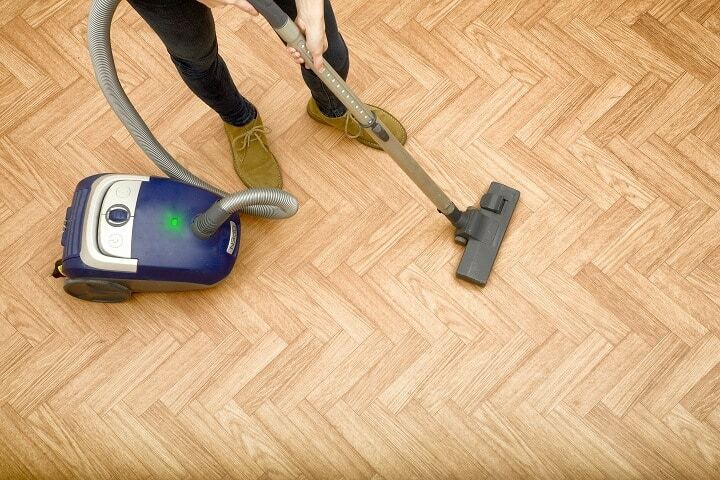 For this reason, vacuums with a lower height or features to adjust the height are ideal for wood floors. Alternatively, you may purchase a vacuum that’s designed with the height of a carpet in mind, but it will need to compensate for the distance with really powerful suction. When it comes to vacuum’s power, engine size and suctioning capabilities play a role, but nothing is more important than the unit’s air flow. Air flow refers to the unit’s ability to create an airflow across a surface to effectively move dirt, drawing it into the vacuum for collection. A unit’s airflow (and therefore how much cleaning power it has) will be measured and described in the product specifications as cubic feet per minute (CMF). When shopping around for an effective vacuum, remember that the more CMF the product has listed, the better its cleaning ability. Especially if your home is large, the mobility of your unit is going to be a big determiner and how easily and efficiently you’re able to vacuum. If the wheels of a vacuum are stiff or inflexible, you might find it difficult to drag from room to room. The perfect product will have a set of soft wheels that will allow you to tug it along effortlessly. Selecting the wrong wheels will also lead to scratched, damage flooring. For use with hardwood floors, always be sure the vacuum wheels are made of a soft rubber rather than hard plastic. Often, vacuum units designed especially for use with hardwood floors include padding features that soften any hard edges and lessen the chances of damaging the wood. Whether you’re purchasing a vacuum for dual-use or for hardwood floors alone, it’s essential you seek out a product that’s adequately padded. Most types of padding are made of felt or rubber that’s attached by adhesive to the underneath of the vacuum and serve as a barrier between any hard surfaces and your flooring. For carpets and other soft surfaces, you must be careful to never purchase a vacuum with a suction that will trap or bunch the fabric itself. For hardwood floors, however, the more powerful the suction the better. 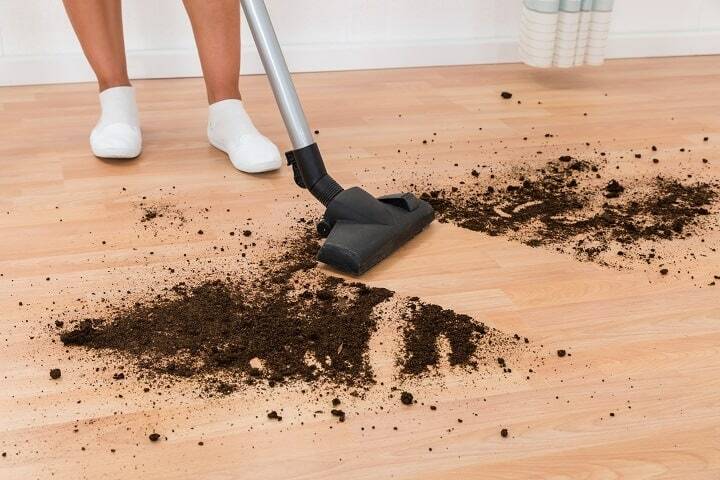 In fact, extra suction is sometimes necessary in use with hardwood floors because the design of some floors allows small flecks of dirt and debris to sink between the floorboards, remaining impossible to remove without the help of a powerful suctioning. For those who want the best of both worlds, there are vacuums on the market with adjustable suction features. These are especially ideal for those who are wanting a vacuum to do double-duty and clean both carpet and rugs as well as tile and hardwood floor. Without the right attachments, the corners and crevices of your home will be left filthy and disgusting. While dozens of attachments in all different shapes and sizes might not be necessary, a few of them are key. Some attachments that are necessary for almost any home include dusting brushes and crevice tools. Pet owners may find accessories such as those specifically designed to pick up dog and cat hair especially useful. If you’ve ever had the unfortunate experience of having to use an older, outdated vacuum cleaner than you’ve probably witnessed the way some units scatter and blow dust and debris, creating an even bigger mess. 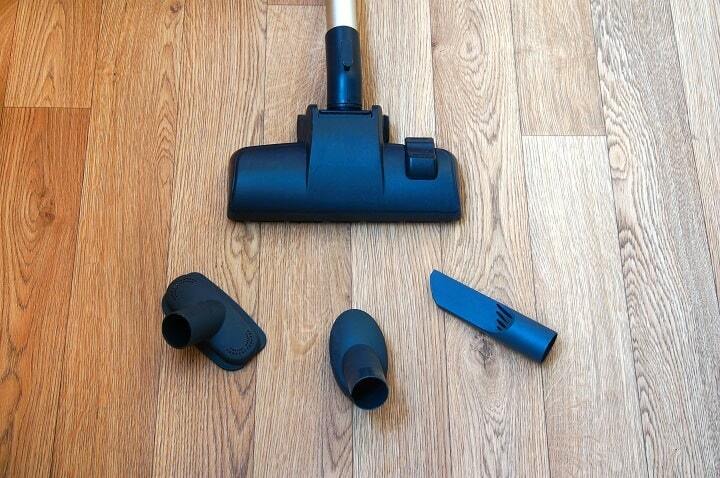 Vacuums with faulty exhausts are especially problematic when it comes to hardwood floors. While the unit may be able to successfully gather animal hair and crumbs, its poor exhaust system will leave behind clouds of animal dander and dust. When these particles settle, they become especially problematic for those with allergies. Vacuums with effective exhaust systems, on the other hand, collect dust and small debris safely into well-sealed, allergenic bags, not permitting it to escape or further contaminate your home. If you’ve ever haphazardly removed a vacuum filter just to have it explode the mess you just cleaned all over you and your home, then you know the importance of a vacuum with an easily removable filter with a drama-free cleaning process. Most products instruct users to rinse and air dry their vacuum filters monthly to help keep your home clean and your unit running fiercely. After all, a dirty filter is the worst enemy of vacuum suction. However, no one particularly likes the process of cleaning the filter, so the less it has to happen the better. While most products instruct users to rinse and air dry their vacuum filters either bi-weekly or monthly, some lesser products need to be cleaned after nearly every use – a process which will quickly become a nuisance. Cord-powered and wireless units each have their own pros and cons. There is no clear winner between the two – your choice will depend entirely on your individual needs. Wireless vacuums have the added benefit of mobility. In larger homes, the vacuuming process is expedited by the elimination of time spent plugging and unplugging the unit into different outlets around the home. Wireless units also tend to be more convenient to use, as they eliminate the drama of wrangling tangled cords. What wireless add in convenience, however, they take away with unreliability. Like any cordless unit, wireless vacuums rely on rechargeable battery power to run. That means waiting for a unit to charge before using it and often running out of power before you’re finished vacuuming. Cord-powered units might be a little harder to handle, but they’re reliable. Especially if you have a large home, you may find cord-powered vacuums to be your best option. If you choose to opt out of buying a wireless vacuum and decide instead on its more sensible, old fashioned cousin, you’ll want to consider the product’s cord length. For most consumer needs, a longer cord means less shuffling around from outlet to outlet and more convenience overall. Some, however, find that cords exceeding 30 feet are a pain to wrangle when it’s time to reel in. Especially if the product you’re looking at features a lengthy cord but no efficient recoil system, it’s going to be a pain to pack up and store. While most vacuums are dry vacuums that simply use an electric-powered fan to suction dirt and debris into a bag, there is also the deep-cleaning wet vacuum. Much like a premium steam cleaner, wet vacuums use a water filtration system to steam-clean out tough stains and even mold. Often times, it is paired with a chemical cleaning product to become one of the best carpet stain removers. While wet vacuuming is great for deep-cleaning, it’s not ideal for everyday use. They’re harder to operate, more difficult to set up and usually, require time to dry after cleaning sessions. Because dry vacuums work immediately with little or no preparation, they’re the ideal option for routine dust and pet hair collection. Plus, you always have the option to use a mop after vacuuming to clean up harder stains, such as one of these best mops for cleaning floors. When it comes to picking a great vacuum for your hardwood floors or tiling, keep in mind that a higher price doesn’t always mean higher quality. While essential cleaning devices like vacuums are something you should never skimp on, the truth is that you may be perfectly satisfied with a middle-of-the-line product. Sometimes, the higher-end vacuums cost more simply because they have unnecessary bells and whistles you’d be just as happy without. If you’re looking to clean up on a budget, check out the list of best vacuum cleaners under $100. When it comes to choosing between a mop or a hardwood floor vacuum, your best option is simply not to choose. Because mops and vacuums perform such drastically different functions, the best home-cleaning routine calls for a regimen which uses both mops and hardwood floor vacuums. 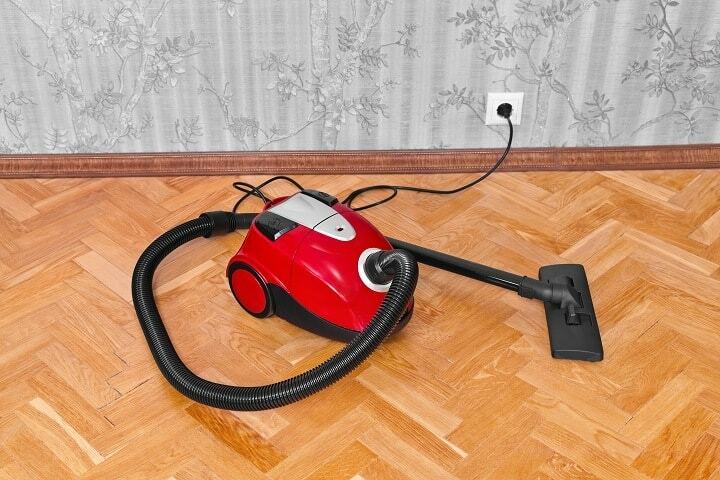 Vacuums should be used to collect loose, dry debris from the floorboards. After you’ve finished vacuuming, you should follow up with a damp mop for the absolute deepest clean. Mops are useful in removing the remaining, leftover particles that have dried and are now clinging to your floor surface. They’re also especially handy in scrubbing off dried residue from spilled liquid or food. When used correctly with the right product, they can also help prevent the settling of dust and buildup of dirt, which lessens how often you have to clean your floors. Mopping also adds a clean, fresh shine to your floors for the perfect finishing look. Brooms are vacuums old school predecessors. While both brooms and vacuums are designed to collect dry dust and particles, vacuums are generally much more powerful. Vacuums are more powerful than brooms when it comes to cleaning potential. While brooms are effective in quickly sweeping away surface dust, vacuums have strong suctioning power that more effectively cleans crevices and tight corners. The major downfall of brooms is that they’re useless when it comes to cleaning a carpet. However, for small sections of hard flooring, a broom is a straightforward and simple solution. Their biggest selling point is that they are extremely cheap in comparison to vacuums and much easier to store. Both steam cleaners and vacuums are valuable cleaning tools used to collect dirt and grime from the surface of your floors. Vacuums rely solely on suctioning power, while steam cleaners implement heat and moisture to eliminate deeper, dried-on substances. While a great cleaning regimen will often include both steam cleaners and vacuums, it should be noted that they do have significantly different purposes and strengths. Because steam cleaners use heated water, they’re useful in eliminating dust mites, germs, mold and fungus that can easily evade a vacuum suction. However, if your floor is covered in dry, loose particles such as pet hair or dust, a vacuum will be much more effective. While bits of dirt and other hard particles probably won’t harm your laminate flooring or carpet, they can cause permanent damage to your hardwood floors. Vacuuming often removes these small, damaging bits that may otherwise go on to cause scratching or indenture. The pressure that these shoe designs put on the flooring can cause pocks and indents in the flooring. To reduce the wear and tear of your hardwood floor in areas that receive high traffic, consider purchasing a fashionable rug to protect the floorboards. Rugs can be replaced easily, your hardwood floor will be much more difficult to repair. Never clean your hardwood floors with a product unless you’ve done your research and you know it’s safe. A natural alternative to harsh chemicals is vinegar. Mixed with a bit of water, vinegar is a wonderful, gentle cleaning solution. With proper maintenance and a regular cleaning cycle, your vacuum should last you for many years. 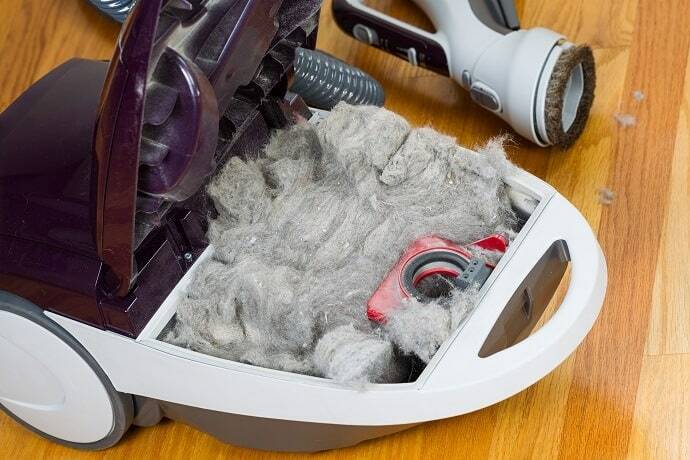 Allowing dust and debris to fill up and clog the interior of a vacuum is the quickest way to cause a short-circuit, overheat it or drive it to lose its suctioning power. To avoid damages on the vacuum motor, be sure to empty the vacuum bag frequently. How often you have to empty the bag’s contents will depend largely on the canister size. Some units will need to be emptied after every use, while others can go a week or two before needing a dump. In order to filter out dust, many vacuums have a filtration unit which is placed before the collection bag. In many cases, this filter can become caked with dirt or dust, preventing air from passing through and causing the engine to overheat or jam. If your unit has a removable filter, you’ll need to check it frequently and keep it in clean, working condition. The quickest way to clog a vacuum or cause it to overheat is by allowing it to pick up objects that are much too large. Before vacuuming, always patrol your floor for potential problems. Large items such as coins, paperclips or other large debris should always be removed by hand rather than left to the vacuum cleaner. A good rule of thumb is that if the object is large enough to pick up easily, it’s too big to be collected by your vacuum. Be sure to charge your vacuum fully before use if you’re cleaning with a cordless model. Otherwise, you’re liable to run out of power halfway through your cleaning process and be forced to wait for the unit to charge. Make sure that any spinning brush roll has been turned off. While this feature serves well to clean carpet, it just scatters dust on hardwood floors. Always check your vacuum bag and/or filter before you begin vacuuming. An overstuffed bag or clogged filter is a key factor in promoting your unit’s suctioning power and cleaning abilities. Never trust vacuums that claim to automatically switch off brush rollers when you move from carpet to hardwood floor. While these features may sometimes work effectively, they’re not worth the risk of scratches and scattered debris. Never mop before vacuuming. Instead, your wet cleaning process should happen after all dust and debris have been removed with a broom or vacuum. Otherwise, you may be damaging your floor by rubbing in the dirt or other damaging particles. Never use a wet vacuum with a cleaning product you haven’t researched. Every substance that touches your hardwood floors should be 100% safe and chemically sound. It’s almost always better to vacuum hardwood floors rather than sweeping. While brooms are a cheaper alternative to vacuums and generally take up less storage space, they also scatter dust more than they gather it. On the other hand, the powerful suctioning abilities of vacuums collect dust more easily and efficiently, stopping the spread of allergens and dirt particles. 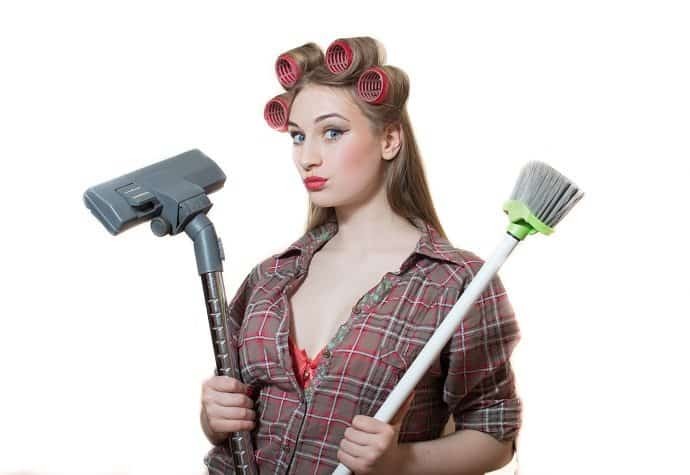 While sweeping may be a sufficient stand-in when vacuuming is not possible, it’s never as effective. What is the best filter for allergies? If you suffer from allergies, you may benefit from purchasing a vacuum with a top-tier HEPA air filtration system. Because HEPA filters remove 99.9% of all particles and allergens, they’re especially ideal for those looking to reduce allergies and remove sneeze-inducing dust mites and micro-particles. Vacuums with lesser filters will likely work sufficiently to collect dirt off of the floor surface but may do very little to truly remove allergens from the air. Can you use a vacuum on both hardwood and carpet? Whether or not you can use a vacuum on both hardwood and carpet depends entirely on the vacuum model and design. At face value, it’s clear that cleaning soft surfaces such as a carpet is an entirely different ball game than what it takes to clean dust off of a hardwood floor. Carpeted surfaces benefit from rollers and brushes that serve to stir the dust particles so the vacuum can effectively collect them. On the other hand, these rollers and brushes will only scatter dust and make a mess when used on hardwood floors. That being said, standard vacuums may be used on hardwood floors if they have no rollers or if the roller function can be disabled. For those who want the best of both worlds, there are vacuum models with separate settings for carpet or hardwood, though they may prove less effective overall than surface-specific units. Your home’s floors can quickly become riddled with dust, dirt and even mold particles – a quality vacuum is your best defense. While carpet and hard flooring can’t be cleaned using the same methods, it’s possible to purchase a vacuum unit that does double duty and effectively cleans both. Implementing a high-quality vacuum into your cleaning routine does more than keeping your floor spotless, it can also reduce allergens in your home’s air, stop the spread of germs and better your overall quality of life. Photos from: Violin / depositphotos.com, AndreyPopov / depositphotos.com, katy89 / depositphotos.com, feanaro / depositphotos.com, tab62 / depositphotos.com and rosipro / depositphotos.com.